With water shortages being reported worldwide and municipal water prices at an all-time high, it’s refreshing to see tech products that are engineered to manage our most precious resource more efficiently. 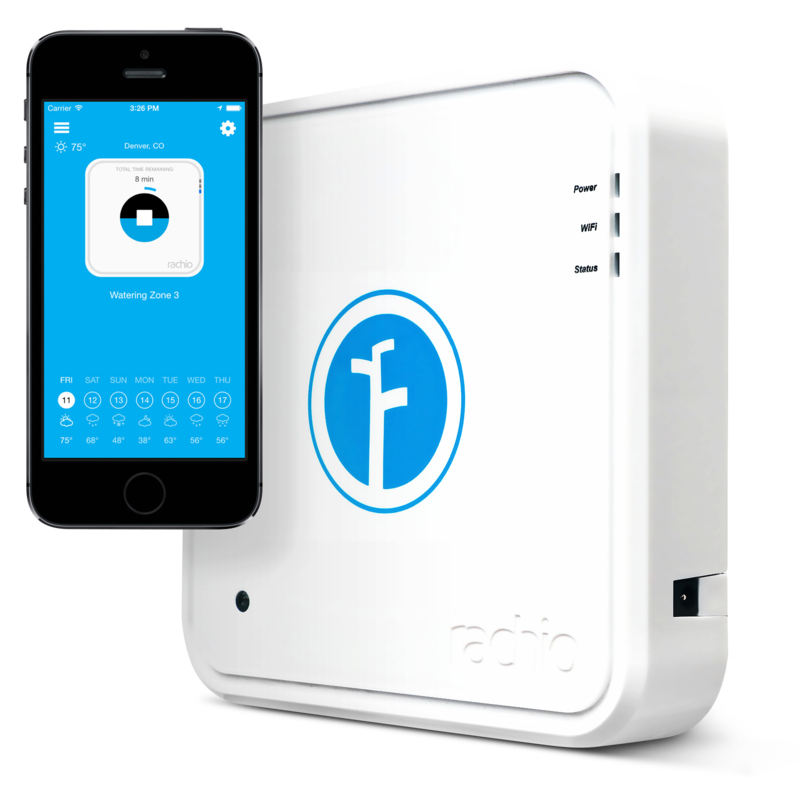 In the summer of 2014, we got our hands on the Rachio Iro, a smart irrigation controller designed by a Colorado based company to save time and money when watering your property. A smart controller is a wi fi enabled device that receives dynamic weather data from local weather stations, and makes alterations to your irrigation schedules accordingly. A traditional Irrigation controller is essentially just a timer, which is often wired to a soil or moisture sensor that suspends the system during periods of rainfall. Another difference is that smart controllers, because they are connected to the internet, can be managed from a remote location, in a smart application on your phone or ipad, or from the web browser on your laptop or desktop. I can honestly say that I liked the Rachio Iro before I even opened the package. I think I felt this way because of the website and the way information was presented. The art on the website is reminiscent of the animation in a Pixar film, and there is an answer to just about every question you could have about the controller. The information delivery is also sequential, flowing in a logical and coherent manner, making it easy to develop an understanding of the Iro. When considering a product like this, I think most people would agree that the most important thing, aside from functionality of course, is that it must be user friendly. Needless to say, the site gave me the sense that the Iro would be just that, and I ordered the unit on the spot. The unit itself is simple and sleek, but certainly robust enough to give the user confidence in its longevity. Consisting of two parts, the plate mount for the wall, and the face of the unit which contains the “smarts” or the computer parts of the controller, the Iro is ready to be placed on the wall right out of the box. All you have to do is wire the controller as you would a traditional controller (feed the wires through the plate mount, and screw it into the wall), and you are ready to go! The Iro needs to have a strong WiFi signal at the controller site. This is a necessary prerequisite when evaluating candidacy for a Rachio Iro. To start the connection process, I downloaded the FREE Rachio application and used a method known as blinkup to share my home’s wifi credentials with the Rachio. I also inputted my local zip code which would allow the Iro to know where it was and what weather stations it could pull data from. Once it was connected, I was ready to start telling the Iro a little bit about my yard. The beauty of a smart controller is that is knows important information about each zone. Rachio has included parameters like slope, exposure, type of plant material, and type of emitter so that Iro knows what type of water delivery methods to use. For example, if you indicated that you had a steep slope in zone three; Rachio would deliver a cycle and soak method, which would eliminate wasted water due to runoff. After you have configured landscape profiles for each zone, Rachio gives you a chance to set some guidelines for the system as a whole. For example, you can choose to suspend your irrigation system on a day where the windspeed is predicted to be high. You can also suspend irrigation if the humidity is supposed to be high and watering is unnecessary. I really liked this feature because it shows you exactly what your schedule is going to be like, and when it will be altered. 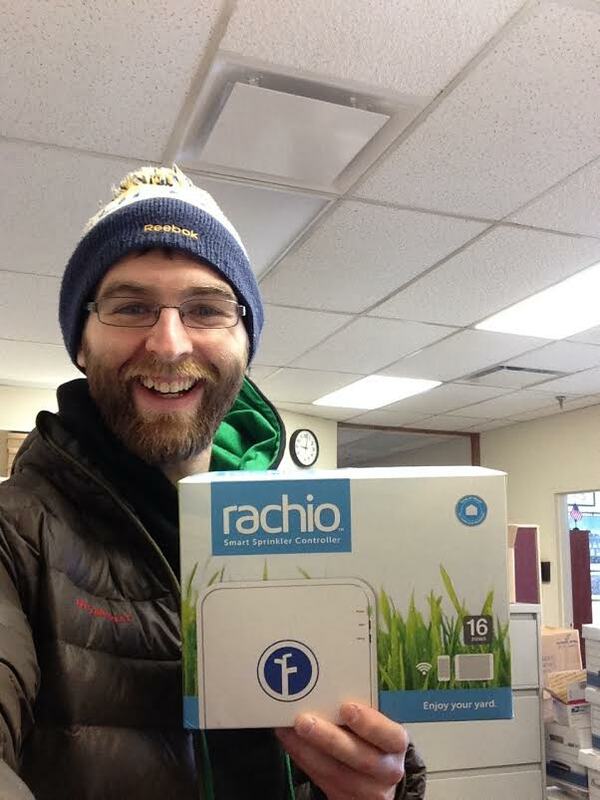 At Aqua Turf, we love the Rachio Iro. The controller is user friendly, it works seamlessly, and it delivers serious savings especially during the summer months. Additionally, the support provided by the team in Colorado is fantastic, all made easier by a website that is designed to give the customer a great experience. We will certainly be installing Iros and promoting Rachio as we move forward in the business of “Smart” Irrigation.